It’s that time again. The time when fangirls & boys lament the lose of endless reading time. The time when we mourn the end of full tv-series binge watching. The time when gaming all-nighters becomes a luxury. And the time when you must abandon your fanfiction writing for more academic pursuits. Yes, it is back to school time. But cry no more Fanboys & Fangirls! I have scoured Etsy (my favorite place to shop on the internet) to bring you the best ways to bring your fandoms to class with you. With these school supplies you’ll be a regular Hermione…aka excited to study! 1. Pokemon Patterned Notebook – Gotta catch ’em all! 2. 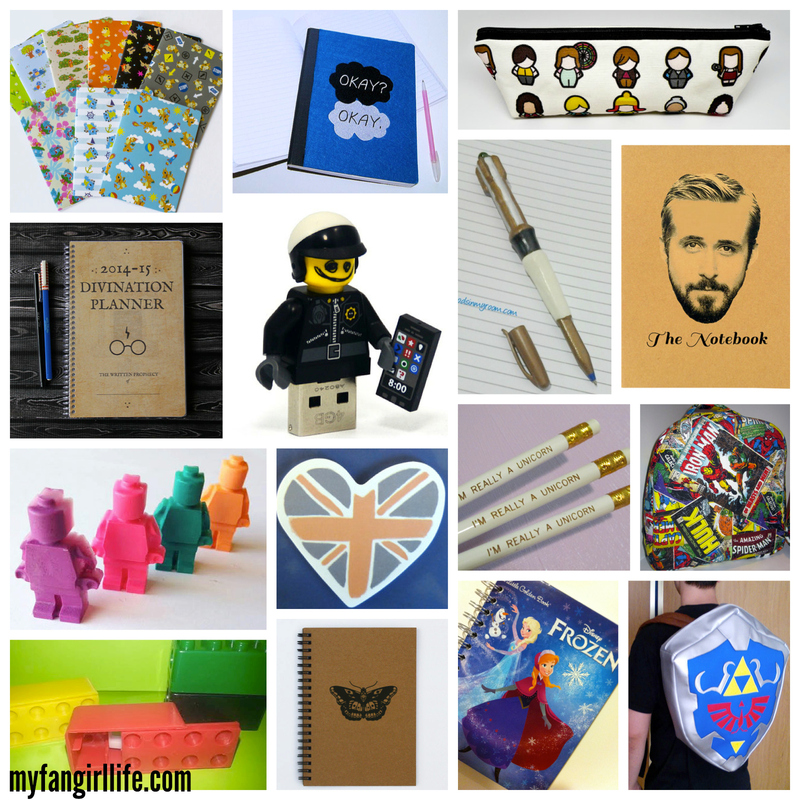 Fault in our Stars Notebook – More than Okay! 3. Firefly Serenity Pencil Case – With all of the ship’s crew aboard. 4. Harry Potter Divination Planner – I am in LOVE with this and have ordered my copy! 5. Lego Movie Good Cop USB Key – To make Everything Awesome! 7. Ryan Gosling The Notebook Notebook – For all your Ryan Gosling related notes. 8. Lego Men Crayons – Color the heads right off them! 9. British Love Sticky Notes – Because so many of the best fantoms are British. 10. “I’m Really A Unicorn” Pencils – I really am. 11. Marvel Comic Lunch Bag – A lunch fit for a hero. 12. Lego Piece Pencil Sharpener – A pencil sharpener and a weapon if someone steps on it. 13. Harry Styles Tattoo Notebook – Subtle One Direction love. 14. Frozen Little Golden Book Agenda Planner – Upcycled children’s books! 15. Legend of Zelda Hylian Shield Backpack – The coolest thing ever. You’re ready for a quest. Or see it all together in my Etsy Treasury “Back to School: Fandom Style“. Time to rule the school! Disclaimer: I cannot vouch for the quality of any of these items. I do not own them; I have not tried them out. I just think they look way cool. I will always explicitly state if a product is one I have bought, tried or been asked to feature.